Who doesn’t love to grill? With the 4th of July coming up, I know that we’re going to be out on the patio all weekend to enjoy the sunshine while sipping on some limonada with friends, grilling up some cebollitas and this tangy new recipe I came up with for the #MizkanLatino cooking challenge. José, Mr. Picky-Picky when it comes to me experimenting with new ingredients, said this dish both smelled and tasted fantastic! With his stamp of approval, you know it has to be good. A note about the use of jalapeños in this recipe: you can absolutely leave the seeds and veins in the jalapeño if you want to give your chimichurri a little kick. I removed them in the video so that the chimichurri wouldn’t be spicy, but would still have all the flavor of a jalapeño so that I could serve it to guests who were a little apprehensive about eating spicy food. I used flank steak here (also known as falda de res) but you can substitute with another cut such as skirt steak (arrachera) if you like. Be sure to check out the linky below throughout the week to see more videos and recipes from others participating in this challenge with me. You can also find out more about Holland House products on the Mizkan website. Frijoles de la olla are a staple in Mexican cuisine. Traditionally, they’re cooked in a clay pot over a fire, or on the stove, but this version is adapted for cooking in a slow-cooker or Crock-Pot. I love the community on our Facebook fan page. I posted a question asking what their favorite Mexican recipes are that they’ve adapted for crock-pot cooking. Overwhelmed with the number of delicious suggestions, I decided to whip up a batch of slow-cooked beans as my final tribute to National Slow-Cooking Month. A few notes: if you don’t have a guajillo chile at home but you have other dried chiles, any other red chile you like and have is a fine substitute. If you have frijoles bayos instead of pintos, that’s a fine substitute as well. To prep this dish the night before, add everything to the crock-pot except the liquids, pork neck bones and salt. The next day, add the liquid and pork neck bones and turn on high. To make this dish vegetarian friendly, you can leave out the pork neck bones and use vegetable broth instead of chicken broth. If you’re planning to let this cook while you’re at work all day, use a slow-cooker that has a timer that will turn the heat off or to a very low “keep warm” setting after the cooking time. You can then add the salt, reheat them for 30-60 minutes in the slow-cooker and enjoy! The results were tremendous, so I recorded a video recipe to show you just how I did it. As we’re preparing for a blizzard here in Chicago this week, I’m glad to have leftovers of this hearty, warm bean dish that is great as a snack, a side dish, or even a main dish with some garnishes. 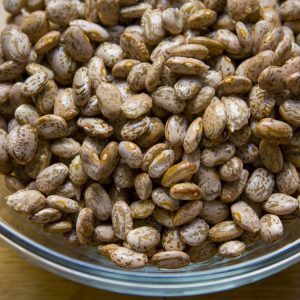 A no-fuss recipe for frijoles de la olla made in a slow-cooker or Crock-Pot with pinto beans. First, rinse your beans under cool water to remove any dirt or debris and get rid of any broken beans. There’s no need to soak the beans overnight! Layer the onion slices along the bottom of the crock-pot. Place the beans directly over the top of the onions. Tear off the stem of the chile and tuck it into the beans and nestle the pork neck bones in the beans, too. Add the chicken broth. Remove the papery skin from the garlic cloves and place in the crock-pot whole. Add the ground cumin. You’ll notice the chicken broth isn’t enough to cover the beans and keep all the ingredients moist while cooking. Add 4 cups of boiling water over the top, making sure all the ingredients are under the broth and water and then put the cover on the slow-cooker. Turn the heat on to high for 5-6 hours (individual slow-cookers can vary slightly in temperature). If the beans start to get dry during cooking, add 1-2 extra cups of boiling water. I only had to add about one cup in the last hour. You can substitute boiling chicken broth in place of the extra boiling water if you like. Add the salt in the last 45 minutes of cooking and stir it in gently to incorporate. The beans should be soft to bite and have a nice broth when they’re finished, but shouldn’t be watery.